The Biogel M surgical glove was created in response to the need for a surgical glove with a superior grip. Surgery procedures can get quite messy with blood and bodily fluids covering instruments. When tools become wet with liquid, especially blood, handling the surgical instruments can be challenging as they become slippery. 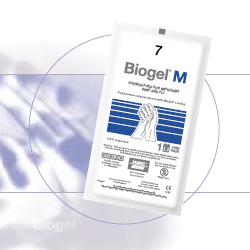 The Biogel M has microtextures to give the surgeon more control compared to smooth surgical gloves. Compared to the original Biogel latex surgical gloves, the Biogel M gloves are exactly the same with the addition of micro-textures. The formulation of the glove and shape is the consistent allowing surgeons to easily transition from one glove to the other. In general, smooth latex surgical gloves will provide the highest level of sensitivity while textured surgical gloves will provide the highest level of grip. The micro-texture found in the Biogel M is the middle ground that offers great sensitivity and grip needed in many procedures.